Stephen Donaldson turned the fantasy world on its ear in the 1980s with his groundbreaking series The Chronicles of Thomas Covenant. That series took the standard fantasy tropes and recast them with an antihero at the centre and richly described and highly original world building. Which is why it comes as a bit of a disappointment in the exposition heavy prologue to his new series that we seem to be back in fairly standard epic fantasy territory. The two kingdoms of Bellenger and Amika have been at war for as long as anyone can remember but the causes of the war are lost in the mists of mythology. Both armies have ground to standstill through their use of sorcerers who can conjure one of six decimates to defeat the opposition. Just as Bellenger gains a tactical advantage through the invention of the gun, all of their sorcerers lose their abilities, it is believed through the use of the little known seventh decimate by their enemies. Bellenger Prince Bifalt is charged with a mission to track down the knowledge of this power and bring it to Bellenger to restore the powers of their sorcerers before the kingdom is overrun. And that is pretty much as far as it goes. The tale after that is Prince Bifalt’s quest. He leaves the boundaries of Bellenger and finds, to his surprise (and supposedly the reader’s), that his world is much bigger than just Bellenger and Amika – although it is never clear why this knowledge was hidden or unknown at least to the elite. By the time the quest begins in earnest the Prince has been brought back from death twice by some mysterious power so he also knows that some part of his mission is a manipulation by someone or something else. 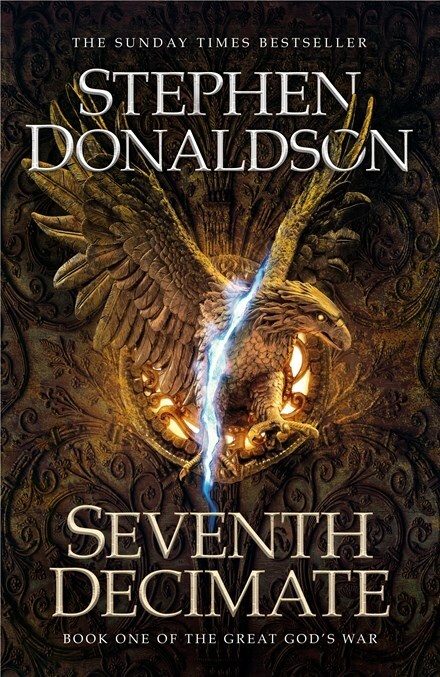 Seventh Decimate feels like paint by numbers epic fantasy. In the endless desert that turns out to be anything but endless, Bifalt and his remaining men are rescued by a caravan that itself feels like it has stepped out of an eastern-inspired epic fantasy complete with dancing girls, scimitars and deadly assassins. And given that Bifalt has been spared from death by the very people he is seeking, the end of his quest and his survival is never really in doubt. But the real issue with this book is the character of Prince Bifalt. Bifalt is not a particularly interesting or nuanced character. While most of his decisions are self destructive he is not an antihero, he is just not a likeable or particularly interesting person. While Thomas Covenant was also not a likeable character, Donaldson did a lot more groundwork around the source of his pain and his actions were believable and understandable in terms of his character. Prince Bifalt has none of those shades of grey and the less the reader cares about him the less he becomes an effective vehicle for carrying the broader story. Seventh Decimate is the first volume of a new series It sets out to resolve its local conflict and put it in the context of a much broader, less defined global war. But it fails to really generate any interest in either. While epic fantasy readers may be satisfied, stock background and unlikeable characters make it difficult to be too excited about either this or any forthcoming volume.